Rita Kohn is an author, playwright, journalist/arts critic based in Indianapolis, IN and a member of the Board of the Dance Critics Association. Carmen is an iconic figure, mythic, earthy, fictional, real. Individuals who might know nothing of her "origins" as well as those well versed in the theatricality surrounding her "story" comfortably use her name as metaphor. For all of us, Ninotchka Devorah Bennahum's seminal search for the origins and imprints of "Carmen" can be of interest. 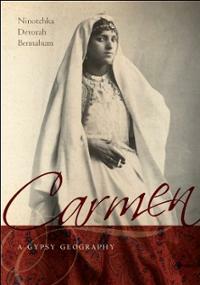 Reading Carmen, a Gypsy Geography is one of those rare treats when a scholarly work becomes absorbing and accessible. We are with Bennahum on her journey to learn how and why Carmen has become part of the fabric of just about every culture on our planet. We witness why early-19h Century novelist Prosper Merimee invented Carmen and how by mid-19th Century she made her larger-than-life appearance in Georges Bizet's opera. Carmen's theatricality is enormous. Bennahum draws attention to story as a nonverbal entity and to a performer preparing a space as the setting from which the story both is enfolded and unfolding. In so doing, we gain not only an understanding of dance as performance, but equally acquire another way of approaching the mounting of any public performance. While verbal communication is uppermost in a play script, language is heightened through precise attention to nuances of movement within a space. Carmen, a Gypsy Geography starts in France with the making of a work of fiction which is transposed into an opera and then moves backward in time and place to our mythic and corporeal beginnings and thence to the influence of the Islamic Mediterranean culture. Carmen's essence flows from Gypsy heritage, a people not welcome anywhere yet whose presence as sojourners migrating from the Middle East into Europe has as a focal point 14th-15th century Spain. Bringing us along the migration, Bennahum shows why we are drawn to Carmen, who for us embodies Gypsy song, dance and guitar style. We live with Merimee and Bizet creating their works and with Picasso, as Carmen's persona enters into his way of seeing and depicting. Utilizing a non-linear approach, the book opens for us "new pathways to reading performance and history." [from Jacket copy] Of particular interest is Chapter Seven, "Space and Place in Islamic Spain: The Archeology of Flamenco." Soledad Barrio is cited as the embodiment of Carmen and flamenco. "The curving of space and contemplative gesture that dominates flamenco" [page 185] initially led Bennahum to research the origins of flamenco and to describe it as "an archival dance of survival."